Epitaxial Growth of Large Area WSe2 Monolayers By Gas Source Chemical Vapor Deposition | Monolayer 2D materials, particularly the family of 2D transition metal dichalcogenides, have been a focus of increasing interest due to their unique properties. The development of device technologies based on 2D chalcogenide has, however, been hampered by difficulties in synthesizing large area monolayer and few layer films. We developed a multi-step process involving nucleation, ripening and preferential lateral growth to achieve epitaxial WSe2 monolayers on sapphire by gas source chemical vapor deposition. This process enables control of the nucleation density of WSe2 on the sapphire and the lateral growth rate of domains resulting in coalescence of monolayer regions over wafer-scale areas with minimal multilayer growth. The process also provides insights into the fundamental kinetic and thermodynamic factors that impact monolayer growth. 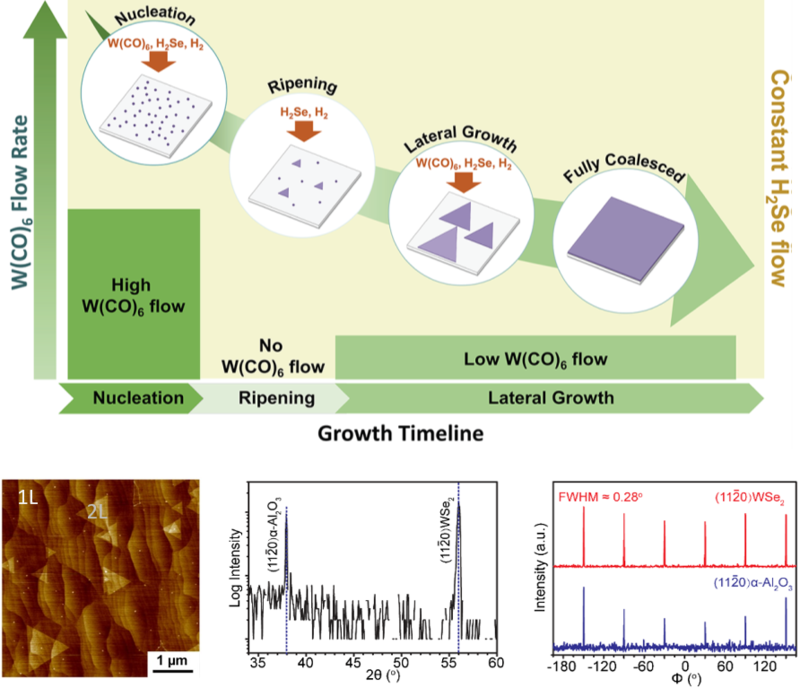 A multi-step process was developed to achieve large scale epitaxial growth of atomically-thin WSe2 layers on sapphire by gas source chemical vapor deposition. The multi-step synthesis method can effectively provide large area monolayer and few layer 2D chalcogenide films. The method was transferred to a wafer-scale MOCVD system that is part of the 2DCC Thin Films Facility and samples grown using the process are currently being provided to external users and collaborators. The multi-step process also provides fundamental insights into the growth process including an estimate of surface diffusivity of tungsten species and the effects of temperature and Se/W ratio on edge facet stability. The process was initially developed on a small-scale CVD reactor in the Redwing lab but was transferred to the MIP MOCVD system which is equipped for growth on 2” sapphire substrates enabling wafer-scale demonstration. The MIP provided additional expertise in high resolution XRD characterization. Collaboration with a 2DCC external user (G.C. Wang at RPI) provided a route for RHEED analysis of the epitaxial films. In addition to the NSF MIP and EFRI 2-DARE projects, Joshua Robinson’s work was supported by the Center for Low Energy Systems Technology (LEAST) which is one of six Semiconductor Research STARnet centers sponsored by MARCO and DARPA, and the research carried out at RPI was supported by a Rensselaer Presidential fellowship (YX). X. Zhang, T.H. Choudhury, M. Chubarov, Y. Xiang, B. Jariwala, F. Zhang, N. Alem, G.C. Wang, J.A. Robinson and J.M. Redwing, “Diffusion-controlled epitaxy of large area coalesced WSe2 monolayers on sapphire,” Nano Lett., 2018, 18 (2), pp 1049–1056.